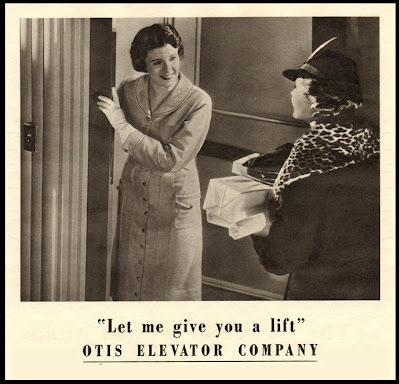 Mysteries of History: The Otis Elevator ~ The History Girl! On August 3, 1811, one of the most famous inventors was born. This man did not become famous for creating something from scratch, unlike other inventors of the era; he took a piece of technology and made it operate more safely and efficiently. He came from a small community near Halifax, Vermont, and was the youngest of six siblings. The product that he improved upon was none other than the elevator; its concept dates back to the Roman architect Vitruvius (287 BC – 212 BC), and through the years has evolved to the modern-day lifts that we use in everyday life. This man did not start his career by improving on the elevator; he had many other inventions that changed different industries - the railway safety break, rail turns for speeding, rails for the four poster bed, and he also improved on the turbine wheel; he is none other than Elisha Graves Otis. Elisha was working for the Maize and Burns Company of New York in 1852 as a machinist. He took on a project that Mr. Maize asked him to come up with a solution for. The company’s problem was that it needed to store supplies on the second floor of the plant - Elisha designed a lift to do just that. The Safety-Hoist Elevator design was so successful that in 1854 he demonstrated the lift with the break system he designed, at the Crystal Palace Exposition in New York City. He was so confident in his new Safety-Hoist Elevator that he stepped onto the lift and raised it to its highest point. He then instructed his assistant to take an axe and cut the thick rope that held the platform in place. The assistant took a forceful swing and chopped the cordage in half. The Safety-Hoist break held, and at that point the elevator industry began a new era. 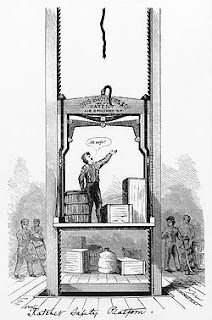 On March 30, 1857, the first elevator was installed in the E.V. Haughwout and Company department store in New York City. The cost of the wonderful piece of technology was $300.00, and only rose forty feet per minute. People from all around the city flocked to the store just to watch in awe as the elevator made its journey up and down. Three major events occurred in 1861. First, Elisha received the patent from the United States Patent Office, for the breaking system of the Safety-Hoist Elevator. Second, on April 8, Elisha Graves Otis passed away of diphtheria (an upper respiratory tract illness), and third, shortly after their father’s death, sons Charles and Norton formed Otis Brothers and Company, by purchasing fourteen competitor companies. By 1873, there were over 2,000 steam powered Otis elevators in use in office buildings, hotels, and department stores around the United States. Each elevator employed an operator. In 1880, the Otis Brothers were hired to install their elevator systems in the White House and at the Washington Monument, bringing the nation's capital up to the times of technological evolution. By the turn of the twentieth century, the Otis brothers were becoming the leaders of their industry, but it was in 1903, when they introduced the Gearless Traction Electric Elevator. This new marvel of technology became the backbone to their everlasting success. Then, in 1931, the brothers installed their elevator in the tallest building in the world at that time, The Empire State Building. Today, Otis Brothers and Company is a subsidiary of United Technologies Corporation, which is the world’s leader in building systems. There are 1.7 million Otis elevators in operation around the world. If you have ever spent any time in an elevator, chances are you spent it in an Otis.